Before I dedicate this blog to a week of training camp some Ironman statistics: a national slant on that average Ironman athlete and that familiar question of whether European or North American athletes are faster? Last time I discussed the topic I compared performances at the Ironman World Championship for athletes originating from the two regions and the conclusions was that over 10 years of results European athletes tended to be the faster of the two. This time I’ll look at results across multiple races over a single year, 2012, to see how the respective performances stack up. Let’s get the technical details out of the way first. I have only considered complete results with a full compliment of splits from full Ironman races held in 2012 (for this reason Ironman New Zealand is excluded again) to minimise potentially erroneous results. North Americans are simply defined as athletes listed from Canada or the USA, Europeans are trickier and in this instance – because it was easy to make the list – are defined as athletes from member countries of the European Union (I know, I’m missing some good Swiss results). The latter choice is somewhat arbitrary as Ironman Switzerland is included among the European races, but it’s done now. I’ve tested both mean and medians for the splits of these two groups and as there is little difference and the mean is easily produced I’ve opted for the mean. The graphs below show the average splits by territory across all the Ironman races along with averages limited to European races and North American races. There is a notable difference between the average European and the average North American, particularly when the race is held in North America. By subdividing races by region we can consider whether the differences in performance are a consequence of differences between the races; Europeans might, on average, be faster simply because European races are faster. 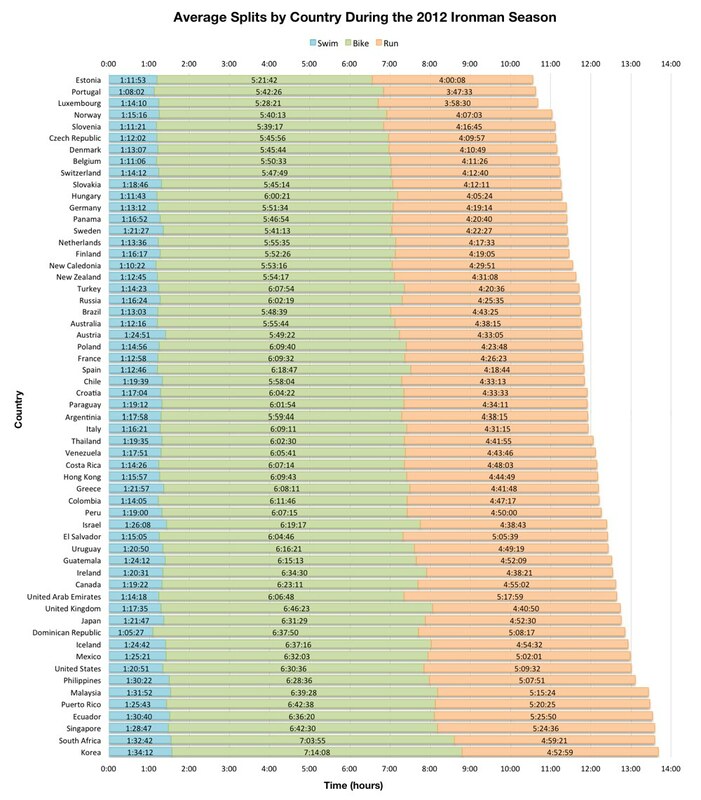 If we took the charts above on their own Europeans appear significantly faster in the US, but there’s a problem, North American athletes heavily outweigh the other groups in all, but the European race series, and larger populations come with more athletes at the slower end of the field. We can also see that with the European data: average European times in European races are much slower than in North American races. In every territory North American athletes come in large numbers and we would expect this to have an impact on the average performance. Examining the percentage distribution of finish times, above, for Europeans and North Americans gives a feel for how the two groups race. By ignoring differing population size the skew gives an indication towards the trends in performances of the two groups. The left skew present in the European data leans more towards the faster European results, while the more broadly distributed North American data supports the slower times. Both territories have fast athletes, but the charts show a sharper decline in European finishers occurring roughly at the 12:00 hour finish time. If I apply the same statistical tests I used on the Kona data last year then the differences are considered significant. Another way to consider this is the cumulative finishers by time as the two charts above demonstrate for athletes across all Ironman races. 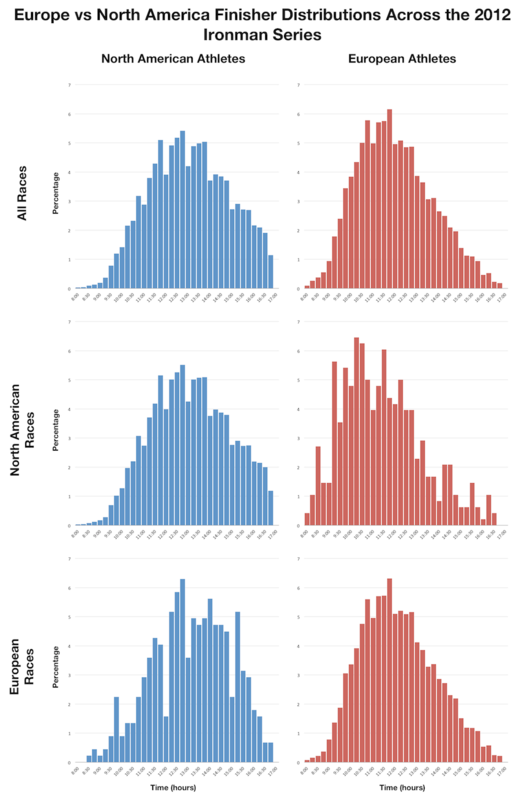 Numerically more Europeans (left hand graph) finish in times below 12 hours despite the smaller overall numbers with North American athletes accumulating after. 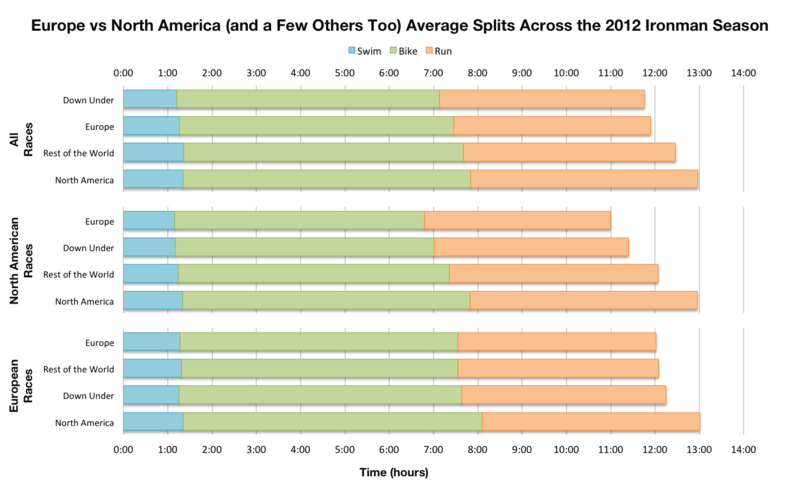 The percentage view of finishers (right hand graph) supports this, up until 11 hours the percentage of Europeans finishing is double that of North Americans, after, the gap closes. The same charts for North American or European races show a similar pattern in percentage terms. More support for the faster European? Perhaps, but the interesting question, beyond the scope of this data, is why? Fewer European athletes race WTC Ironman events, but there are many other long course options and it would be interesting to see how they affect the picture, those that do race lean slightly more to the faster end of the spectrum. In the US more athletes race WTC events with a much broader spread of abilities. There’s no inherent reason to expect one region’s athletes to be faster on average than another. Maybe the difference is cultural – different motivations for participation – competing versus completing, or the relative position of Ironman within triathlon in these two territories. 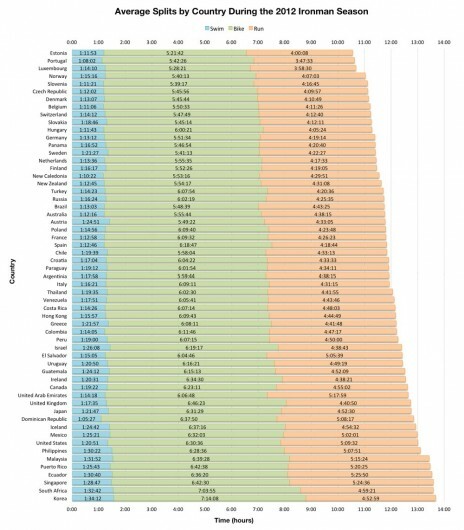 To finish a graph showing some national averages. I thought this might be interesting, but of course, as I’ve noted, the number of athletes heavily influences the averages and this is reflected in the chart below (even though I excluded nations with fewer than 10 athletes competing). Still here are the fastest nations by their average splits.